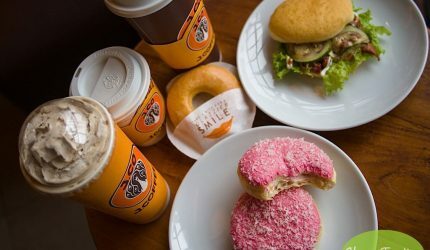 It’s been more than three years since J.Co Donuts and Coffee came to the Philippine shores. I still remember the unbelievable long queue on the very few branches they had. We can’t blame those people as happyfoodies too raved about their not-too-sweet but delicious donuts. Lately, J.Co has a more relaxed atmosphere with more manageable lines that doesn’t seem to be in a state of panic to take home boxes. People can enjoy coffee, frappes and their donuts in an unhurried pace and actually share some quality chats with friends. Happyfoodies was just glad to find a window-side table with comfy chairs and get to try what’s new to add to their old-time favorites. I’m glad an old favorite cafe returned. 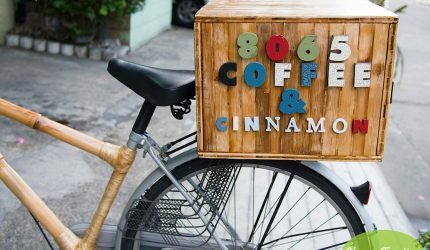 Coffee 8065, a cafe owned by the same people behind 8065 Bagnet re-opened early this year in a new location within San Antonio Village in Makati. Moving from their former home, on the 2nd floor of an old building along Estrella corner Pasong Tamo, their new home is more accessible being on the streetside. A bambike (bamboo bike) holds their signature sign parked just in front of their entrance. From outside, it looks like one of the houses in the neighborhood; inside is the familiar cozy ambiance with a very homey vibe. The whole region of Palawan has cashew trees in abundance. Even in El Nido where I stayed for a while has people freely picking out fruits of these trees by the roadside. 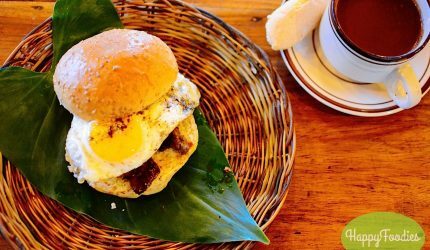 It is no surprise Isla Casoy de Palawan, a humble cafe at Mercado de San Miguel in Puerto Princesa has a menu offering based on the local favorite Casoy or cashew nut. It has become a favorite stop for me in the city not only for pasalubongs (take-home presents) but also its cashew-infused meals and drinks. It’s not your usual toast. 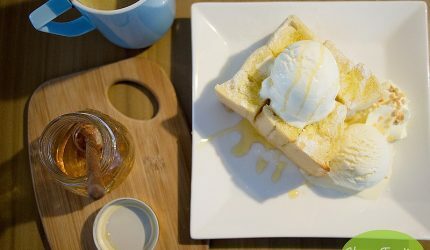 Cafe Shibuya has signature high toast that are 2 1/2 inches thick, topped with a single ice cream scoop or two and sprinkled with powder, fruits or chocolates depending on your desired flavors. Just looking at the variety of offerings from the menu, it’s challenging to make a choice as most look delectable. Choosing drinks was quite easy as I love coffee and matcha and they have a blend of both. It still breaks my heart seeing the actual rubbles of Bohol’s heritage churches when after a year the island experienced a devastating earthquake. The church from one of my favorite haunts, Baclayon was not spared. I remember frequenting the Baluarte right across the church for some afternoon sea breeze, sunset and cheap but good barbecue stalls. Is also a delight to see a newly opened cafe, Baclayon Heritage Café. So timely I was yearning for a good hot drink and snack that afternoon so I got to try the place. There is a certain zen moment that I like about Vietnamese coffee. The time I wait for the coffee to brew and drip from the phin (a small Vietnamese brewing device) to my is a quiet still moment I savor every morning. I like the unhurried air it brings. There’s also the yin and yang combination from the ironically smooth yet strong coffee and the creamy sweet layer of condensed milk. 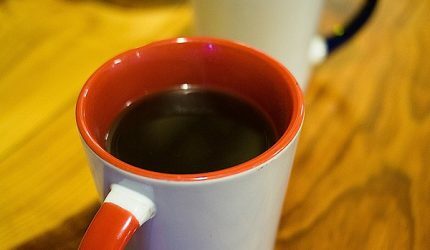 Their perfect blend is just a satisfying reward for that short wait. More than the coffee, I also appreciate the surrounding of the cafe which adds to the experience of drinking coffee. 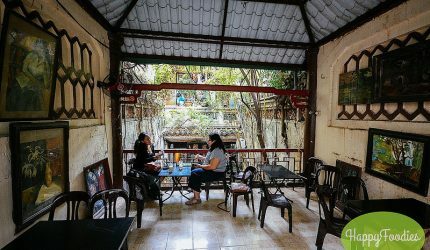 That’s why in Hanoi, Cafe Pho Co, was a delightful find, tucked deep within rustic buildings past the souvenir shops fronting the streets. Ancient walls, a charming cat, unique coffee with egg and views one can get lost in moments. It became my temporary office in Bontoc. The cozy sofa and chairs, the tasteful interiors heavy on the travel theme coupled with beautiful photos of the rice terraces and people of the Cordilleras is truly inviting. My almost weeklong stay in Bontoc finds me at Goldfish Cafe catching up on work and the online world. For Bontoc standards, Goldfish Cafe is the fanciest cafe in town. 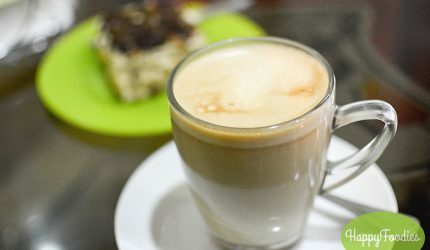 For a town whose local coffee culture is quite predominant already how does Goldfish Cafe’s specialty coffee offerings fare? 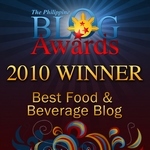 As repeat visitors to Sagada, we at Happyfoodies were both overjoyed and saddened during our recent visit. 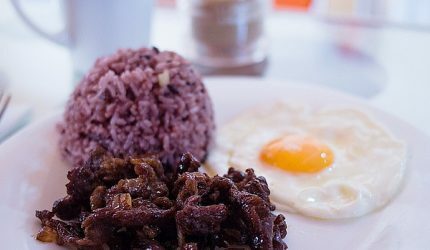 Saddened because a) Misty Lodge’s restaurant is closed as Chef Bogan is attending to her mommy duties in Manila, b) Masferre Restaurant has taken off our favorite Kamatis Bagoong at Lechon Kawali in favor of a menu more oriented towards foreign guests. But on a bright note, we chanced upon a new, welcome addition to the eateries lining the town’s main street: Sagada Brew. It was actually the recommendation of Wanda, our kind hostess at Rock Inn Farm, to try out the new place (talk about very friendly competition). It was also a blessing to come on an off-peak season where a lot of eating places are closed for repairs, which helped directed our feet to this shop.